COMMENTARY ON "SOME LESSONS FROM JOB"
Today’s lesson is very valuable. At the end of the day we should know what we are to trust in God and his Word. Other forms of study can be helpful but should be used magisterially (in submission to the Word) rather than magisterially (as an interpretive tool over the Word). Notice in the above text we do in fact have a possible eschatological referent. At the very least it can be asserted that Paul is speaking of an event in the future from the moment in which he is writing. However this isn’t the case in the entire passage. Notice in the above texts that the chapter division does more harm than good when trying to understand the full pericope. Both the present, past, and future are in Paul’s view. It’s not fair to limit any of his teachings to one particular point in time. The authors attempt to force a singular referent tells me that there is something in the text he doesn’t want to believe is presently true. Today’s lesson brings up once again the problem of evil. Ironic as it is, I find that the way they present it falls into the same trap as Job’s friends. The author attempts to philosophically rationalize evil within God’s plan. Most of those coming from an Arminian point of view, like Seventh Day Adventists, will do this in a way that comes off sounding like they are God’s lawyer. God doesn’t need a lawyer and he doesn’t need someone making excuses for him. One cannot simply deny that God created Satan. And to deny that he was aware of what Satan was going to do would be to deny the Omniscience of God which is a clear Biblical doctrine. While it is fair to not want to speculate the inner council of the Triune God, one cannot deny facts. For God’s reasons he freely chose to create a being that he knew would at one point or another be evil. He also placed a tree in the garden in a place which he knew would be easily accessible to Eve. Thus one must conclude that doing this on God’s part was good, because the goodness of God is also Biblical. The problem presented by atheists, agnostics, and arminians is the assumed worldly definition of good. Biblically, the word good does include the possibility of creating beings with the full knowledge that they will do evil, setting limits on how long that will be, and then righteously judging it in the eschaton to the glory of God. I hope this demonstrates to the reader the proper place of reason when interpreting scripture. You must bend to the Word rather than the Word to you. This isn’t to present a cop-out for thinking, it’s a sound methodology for rightly interpreting scripture. For starters I would not have picked John 8:1-11 as the text is likely apocryphal. In the oldest manuscripts you won’t find this story. That doesn’t mean it’s not true, it just means that the story likely isn’t apostolic in its origins. The proper way of using an apocryphal text is to interpret it with a clear passage of scripture elsewhere. Instead of doing this the author uses Ellen White. “In His act of pardoning this woman and encouraging her to live a better life, the character of Jesus shines forth in the beauty of perfect righteousness. While He does not palliate sin, nor lessen the sense of guilt, He seeks not to condemn, but to save. The world had for this erring woman only contempt and scorn; but Jesus speaks words of comfort and hope.”—Ellen G. White, The Desire of Ages, p. 462. The problem with this quote of Ellen White is that she presents the Grace of God as a means by which to overlook sin rather than to pay the debt due for it. These are two very different concepts and the Gospel itself hangs in the balance of it. She presents words that at the very least need to be defined. Perhaps the author could have used this opportunity to fill the gap but he didn’t. The scripture teaches that the reason we have received Grace is because Jesus has paid the debt that was due to our infractions. It’s not a get out of jail free card, and it’s not cheap. Jesus paid for it with his very body. It is true that Job needed to hear the Gospel rather than false law given to him by his friends. And in a general sense the lesson does present some good life advice. If you have a friend suffering from illness perhaps you should consider cooking a meal for them rather than going on a theological rant. On this I would certainly agree. In a general sense the author of today’s lesson actually goes a good job in pointing the reader to God for hope rather than to the world. Some specifics as to why that is necessary, regarding sin and man’s need for a redeemer would have been nice. So I will say that I wish they had taken it to the next logical step. But as it stand’s it is good advice to look to God rather than to the world. I like that the author of today’s lesson turns us to types and shadows of Christ in the Old Testament. Many teachers today will say that you have to cross your “red sea” and slay your “goliath” or whatever. Jesus teaches us that the Old Testament is about himself. That being the case I really did enjoy this lesson, it is good and helpful to reflect on Christological types and shadows. 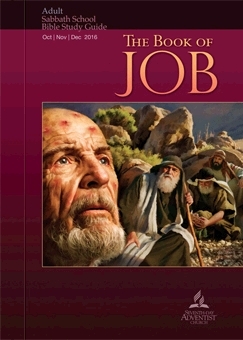 The writer gives his final thoughts after completing a study on the book of Job and I will give my own. My biggest problem with this study is that the writer has given us a lot of law and unbiblical philosophy with little to no gospel. There were plenty of opportunities to preach the gospel to the audience through the book of Job, but they were not taken. And instead of presenting the Gospel, when Grace was discussed it was functionally utilized as a means for God to overlook sin rather than as a means to sin itself disposed in the Body of Christ. A bible study or sermon isn’t complete without the Gospel rightly preached as Jesus sacrificed and risen for us. There is just no point at all to any of this without that. I don’t care if you’re studying the end times, the gospel is still the ending thesis. Even if you’re building on the law for it to perform it’s function, you must finish with the Gospel or you just end up dead as that is the primary function of the law. I don’t mean this in a way to be nitpicky, I genuinely want SDA to be blessed when they read their quarterlies. So as an open request to any Adventist teachers who may be reading, please include the gospel in your lessons even when the quarterly does not. People need to hear it. Copyright 2016 BibleStudiesForAdventists.com. All rights reserved. Revised December 20, 2016. This website is published by Life Assurance Ministries, Camp Verde, Arizona, USA, the publisher of Proclamation! Magazine. Contact email: BibleStudiesForAdventists@gmail.com.